(That link is bandwidth limited, I private messaged you a non-bandwidth limited link in the event that one doesn't work). Everything else is the same as the standard one one supplied and the JoeQuake 0.14DEV download. We were trying to be very conservative. We had other ideas for subtle improvements like cl_forwardspeed 999, but we decided that any big deviation from the defaults should be put into a supplied autoexec.cfg or something, not in a pak file, so a user could open and see what the settings are. Well, I get your problem, but on the other end this will cause a huge performance slow at their computer, and I already see their screamig posts like "joequake is REALLY slow on my comp, what do I do?!?" A newbie who doesn't know what's the transparency slider bar for will also be confused why his joequake is slow like hell... What do you think? Hard nut that's for sure. The goos way of implementing would be of course is to set the sensitivity back to its previous value which is used at non-zooming. But all sure this would have to be customized by the user. What if we just simply remove the whole zoom thingie at all? Ok, we'll remove the zoom key altogether and scrap r_novis 1. Maybe there should be something on the options screen to turn on transparent water like "Software Transparency ON/OFF" that turns R_Novis 1 on or R_Novis 0. Btw, on ProQuake cheat-free servers, it is my understanding that using vised maps will not permit you to play. I always long used r_novis 1 because I could play anywhera and stll have trans water. Why not make it so that if the water alpha slide bar is all the way up (at 1) , r_novis=0, and with it anything < 1, r_novis=1? Would that be possible? Someone with a computer that chokes on r_novis rendering of transparent water would want to use vised maps and they would still use r_wateralpha, and in that event they would not be using r_novis 1. The best way to solve this wateralpha problem is to remove the slider from the video options menu. At least I see this currently. The easy installer I built for JoeQuake supports conditionals, meaning it can pop up a message box with options. I could set it up to ask about the user's hardware and then either set r_novis to 1 for a power machine or have r_novis set to 0 and a message to visit the joequake.quake1.net for more information. Later tonight, I will private message you the information on the installer I am using (it's a free installer and a very nice one) and provide you the project file so you take mine and modify it if you choose (and get an idea of how it works). It would be nice to leave the wateralpha bar in, I think most people like that feature. Besides, no one can stay a newbie forever, might be a good starter topic for someone to visit your website and forum. Ok, I like the idea. Gonna check out your installer, thanks. Unlike some other installers, this one is lean and mean. for one, to see transparent water u need r_novis 1.
because even with the slider u have to set r_novis in console. On another note. Since people are complaining about how jq and jqpro are sharing /joequake and fmod etc.. Im going to rename jqpro to something entirely different. Like how JT named his conversion to TREMOR, and others..
this will keep joequake, joequake... without any confusions. Like how JT named his conversion to TREMOR, and others.. this will keep joequake, joequake... without any confusions. You can't have Tremor and JoeQuake or JoeQuake Pro simultaneously installed because the Tremor fmod.dll overwrites the JoeQuake or JoeQuake Pro fmod.dll. Btw .. Sput, I was the one who had mentioned this Yellow about the file sharing issue (but I think you know). I'll give you EZ installer source files as well. 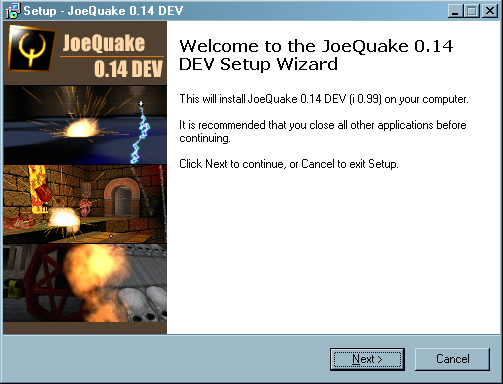 I noticed this problem when creating installers for Quake (shareware)/ProQuake/JoeQuake and I was going to make one for yours and noticed the file overlap. well i use fmod.dll v3.74, it should still work with joequake. 3.74 is the most current. Last edited by sputnikutah on Sun Jun 19, 2005 2:04 am, edited 1 time in total. Check private messages, I sent you source/project files for easy installer if you are interested. Not if one uses vised maps. And it is meant to work with those! I like your installer Baker. Really a nice one! Heh... Well it does happen every time I hit the wrong key (s, +back) but that gamma fix tool aguirRe liked works perfectly so it's no big issue anymore tbh. Thanks for looking though. Joe, check this topic out..